Here’s a great little piece of history, courtesy of Tom Burke. 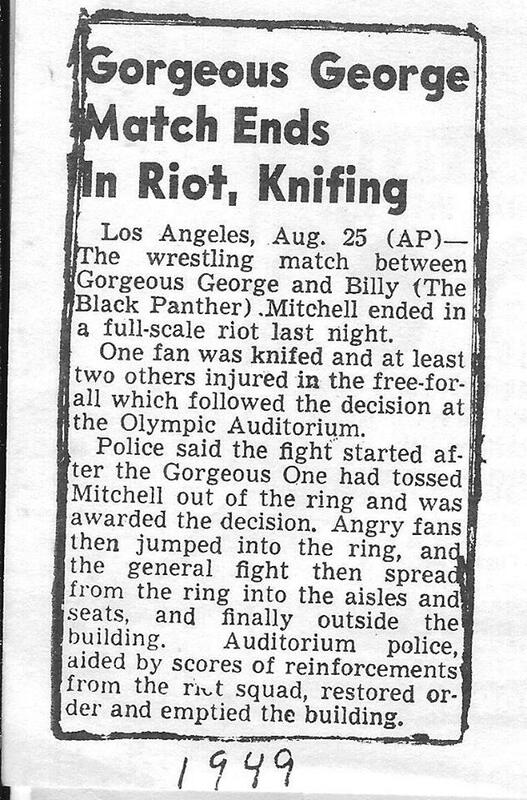 This is the newspaper article about the riot that began after Gorgeous George got “The Black Panther” Jim Mitchell disqualified during an August 24 match in Los Angeles. Not sure why Jim Mitchell is listed as Billy Mitchell, as I have no record of him working under that name, but I will be looking into it. Jim Mitchell was a native of Louisville, Kentucky. He was an African American who helped to break the color barrier in wrestling. In fact Mitchell was wrestling before there even was a color barrier. I’ve paused my work on Mitchell’s biography to work on the bio of Lord Leslie Carlton with his lordship’s daughter, but I am hoping to get back at it later this year in hopes of a 2016 release. If you have any stories, or know someone who does, about this forgotten legend, please pass the word.